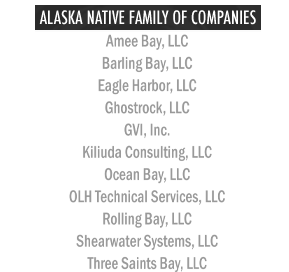 Three Saints Bay is the Holding Company for a group of 8(a), Alaska Native Corporation (ANC)-owned, Small Disadvantaged Business service companies. A Holding Company owns part, all, or a majority of other companies' outstanding stock. Three Saints Bay does not produce goods or solutions itself; rather, our purpose is to provide services to our own subsidiaries and manage the ownership of shares of subsidiaries. Our family of companies provides services to federal and state government agencies including the Department of Defense (DoD), civilian agencies, and intelligence communities. Each company has its individual size standards, unique qualifications, past performances, and customers. Leveraging our consolidated capabilities through corporate affiliation allows all of our companies to increase our offerings to each of our clients. You may visit a Family Company's website by clicking a logo below. Alaska Native Villages suffer from some of the worst poverty in this country. In an effort to improve these economies, Congress has given Alaska Native Corporation (ANCs) unique rights in the Federal procurement process. These rights provide the Federal agencies and government contractors with strong incentives to contract with ANC firms. Below are some examples of how doing business with any subsidiary of Three Saints Bay, LLC can benefit you. Department of Defense (DoD) Indian Subcontracting Program, "The Native American Incentive Act", provides an incentive to DoD prime contractors who use Indian organizations and Indian-owned economic enterprises as subcontractors. If an RFP includes Clause 52.226-1, entitled "Utilization of Indian Organizations and Indian-Owned Economic Enterprises,"the program provides for an incentive payment equal to 5% of the amount subcontracted to the Indian organization or Indian-owned economic enterprise. Subcontracts awarded to an ANC shall be counted towards the subcontracting goals for small business and Small Disadvantaged Business (SDB) concerns, regardless of the size or Small Business Administration certification status of the ANC.